According to the community health center in Menteng, in a single division around Jalan Proklamasi 158 residents died of heroin overdoses from 1998 to 2007. In June 2000, a riot broke out around Jalan Proklamasi. More than three hundred youths from at least two warring gangs took to the streets. They began by attacking each other, then turned to smashing car windows at random, throwing Molotov cocktails, and blocking roads with burning tires. By the end of the day, the disturbance had been quelled. Several motorbikes had been set on fire and a police car overturned, its windows smashed. On this occasion, no fatalities occurred. This was not a political protest or demonstration that ended in violence; it was a fight between bored, angry youths from neighboring communities. The specific grievances that sparked the riot were obscure and trivial. In the past, fights and brawls broke out frequently in Jakarta. There are plenty of bad excuses to explain the violence. There isn’t much work for young people. There isn’t much to do. People are poorly educated. There are a lot of drugs and drug dealers in the district. Drug dealers have money and power. When they squabble over territory, gangs of young people who are their customers or underlings get involved. The young men and women in the poor districts of central Jakarta use heroin, marijuana, methamphetamines, and other drugs. Sometimes these drugs kill them. According to the community health center in Menteng, in a single division around Jalan Proklamasi 158 residents died of heroin overdoses from 1998 to 2007. Other people died after they bought drugs there and used them elsewhere. Even more died from AIDS, septicemia, and hepatitis contracted through drug use. 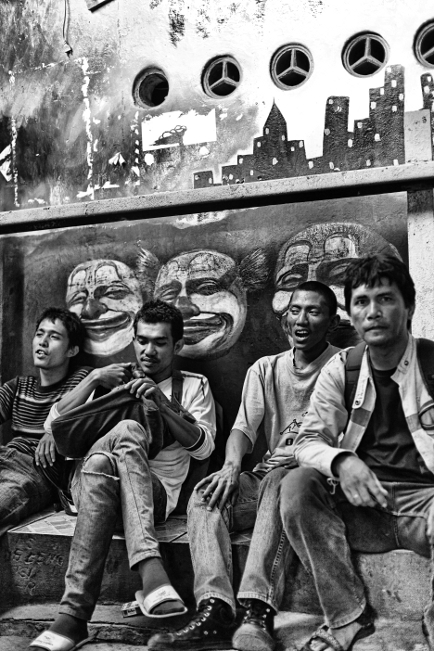 Drugs, gang violence, unemployment, and crime have not disappeared from Jakarta. However, several districts around the Proklamasi area have transformed themselves dramatically over the past few decades. Not only have they driven out drug dealers, they’ve also made it possible for young drug users to become productive, useful members of the community. Benk Benk Art’s, a young artist from this district, himself a former drug user and one time convicted criminal, serves as a volunteer outreach worker for a harm reduction program administered by the government-operated Cikini community health center for intravenous drug users. Through this program, to prevent the spread of HIV through the community, he actively discourages injecting drug users from sharing needles. To achieve this, and through the health department sanctioned program, he exchanges used needles for new ones, explaining the risk of sharing to each recipient. He also encourages the youths of the district to understand their legal rights, to engage in rehabilitation programs if they are ready for them, and to otherwise take control of their lives and make meaningful, responsible choices. In 2007, Benk Benk Art’s set up a sanggar, or clubhouse, on land near the railway in the Proklamasi area. The clubhouse is a well-constructed shed decorated with graffiti images of heroes of alienated youth, such as the musicians Iwan Fals and Harry Roesli. The shed contains donated musical instruments, amplifiers, and some recording equipment. It also has a library of scavenged and donated books, and a computer. There is a small, pretty garden to the side and a large platform in the tree where people can lie back and enjoy the breeze. A lot of the young, mainly male drug users in the area love music. They are particularly fond of heavy metal, punk, and reggae. Some of the young men who come to the clubhouse have formed a band called Cispleng. Most band members have used drugs. Some still do. At the very least, some are still in methadone programs. The band is quite successful. Their music is sometimes played on the radio. They play at venues around Jakarta. There has even been talk of a recording contract. They play at community events and tutor kids in the neighborhood. The kids in the neighborhood look up to them. They are part of the community they live in. Benk Benk Art’s (far right) at a harm reduction meeting at the clubhouse. Photograph by Irfan Kortschak. Copyright 2010 Irfan Kortschak / PNPM Peduli. We don’t discourage drug users from coming to the clubhouse. They are welcome here. We don’t let people hit up here, but if someone needs a syringe, they can get one. I hand out needles as part of the exchange program sponsored by the local community health center. I work with the center as a volunteer outreach worker. If someone asks or wants to know, I tell them about rehab programs or the methadone program operated by the community health center. But you can’t force people. We don’t try to make them promise to stop using drugs. All the young guys here have done drugs. Before I was in prison, I tried everything. I was never really into it the way some guys were, but I tried everything. I like painting and drawing. I’m an artist. I used to smoke some spliff and then spend the next few hours painting. Back when I was at school, it was mostly pills and a bit of grass. Smack wasn’t really a big thing until the late 1990s. When people here first got into smack, they smoked it on tin foil. Later, people started injecting. These days, I’ve given it all up. If someone’s passing a joint around, I just pretend to take a puff. I don’t inhale. When I was younger, there were always fights between gangs from different neighborhoods. You had to take part. If you didn’t want to fight, everyone said you were gutless. At least ten of my close friends were killed fighting. Guys used to drink and take pills before they went out to fight. I went to prison in 1996. It was nothing to do with drugs. One of the local tough guys disrespected my girlfriend. I’m not into violence, but I couldn’t just do nothing. I stabbed him in the belly with a knife. When the police got me, they tortured me at the station. They held me against the wall and hit me. They put my hands under a chair and sat on it. They did all kinds of things. There was no reason for it. That’s just what they do when they arrest you. After that, I was sent to jail in Salemba. There are a lot of drugs in prison. They are cheaper and better than they are on the outside. It’s completely open. The police don’t bust anyone for drugs in prison. The guards don’t stop you. They are the ones who sell the drugs. It’s harder to get a needle in prison than it is to get drugs. You can rent an old one for Rp 2000. People just keep on using the same one over and over again. When the point gets blunt, they sharpen it on the side of a matchbox. When I got out of prison, I was sick of drugs. I wanted to do something with my life. I wanted to grow as an artist. I wanted to help my community. I started doing some volunteer work with an NGO. I visited prisons to talk about HIV and AIDS as part of a harm reduction program. It was easy for me to talk to the guys in prison. Some of the guys I knew were still in there. We couldn’t hand out clean syringes. We just told them about the risks of hitting up and how to avoid them. The community had begun to change, too. There weren’t so many drugs around. The gang wars had stopped. And the community study center, Rumah Belajar, was running. The community study center changed the community. It gave kids something to do. I respect Pak Megi and the other people who are involved in it. They have helped a lot of people. Sometimes, though, they can be a bit overprotective. They are scared that some of the guys will be a bad influence on the younger kids. The young guys felt like they needed a place of their own. We needed somewhere to relax and play music. At first, the clubhouse was just a patch of ground next to the railway where people hung out and played music. In 2007, we spoke to PT Kereta Api to see if they’d let us use the land to build a place where we play music. After that, we built this shed. About a year ago, General Electric donated some musical instruments and some recording equipment. There are a few bands now. The most successful is Cispleng. Their music is played on the radio. They play at events around Jakarta. All the guys are from around here. Most of them used to use drugs. I think one or two are still on methadone. They’ve cleaned up a lot. When the band first started, some people still used, but you can’t succeed as a musician or an artist if you use drugs. In the end, you have to make a choice. The guys who were still using didn’t turn up at rehearsals. They didn’t stick with it.